Back in the 1980s, I spent three years living in Alaska and dedicated as much time as I could to wandering in the woods. Along the way I met most of the wildlife Alaska is famous for. 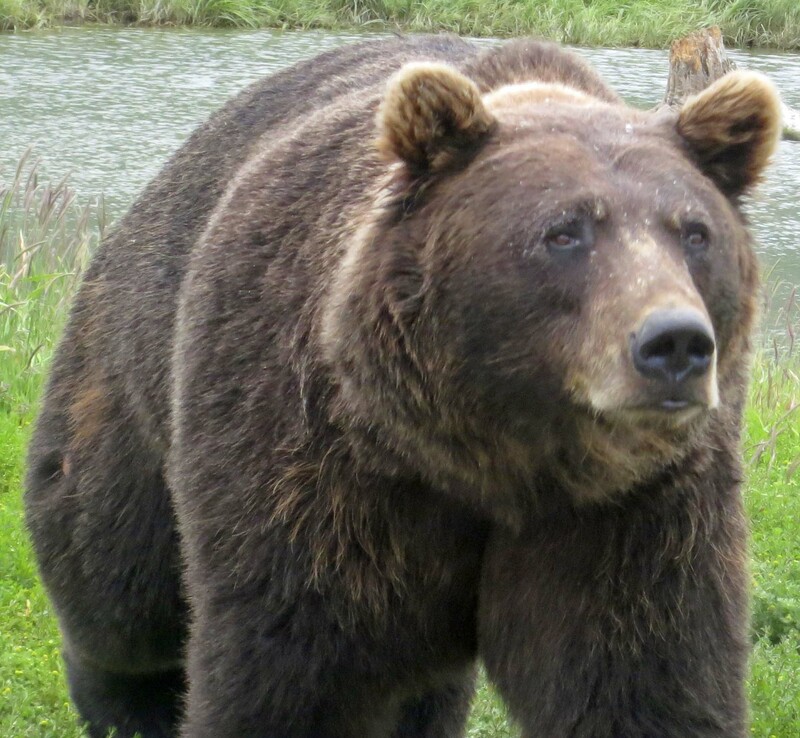 A grizzly bear stalked me on the Kenai Peninsula. I went to sleep listening to wolves howl on a winter cross-country ski trip in Denali National Park. Even more entertaining, a pair of Dahl Sheep had a head-butting contest in my campsite in Chugach State Park. You don’t have to disappear into the vast wilderness of Alaska to encounter animals with big teeth, claws and antlers, however. 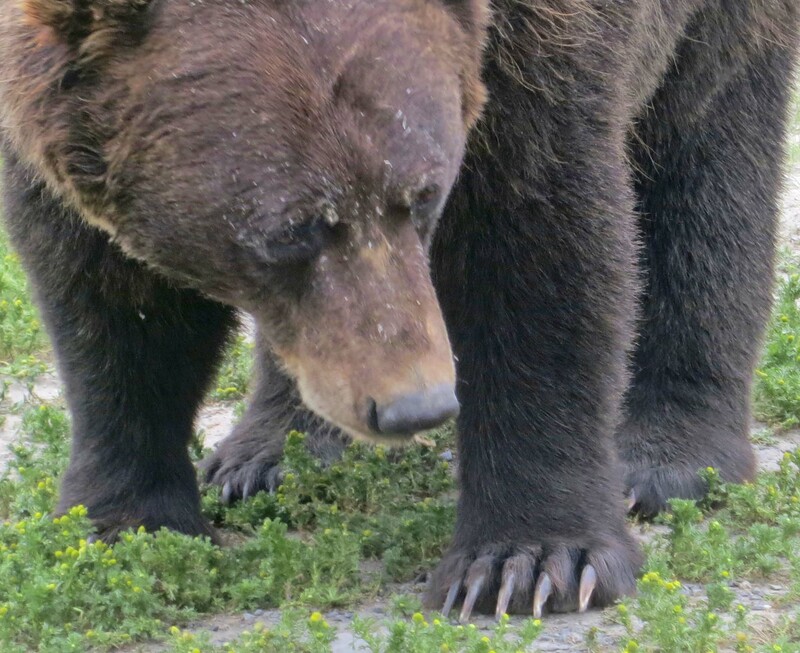 Our friends Edith Barrowclough and David McElroy reported that both a black bear and a moose wandered through their yard in Anchorage over the weekend. They have also seen a wolf and a lynx in the area. Peggy and I stayed with them for four days. Every time Chula the Dog barked Peggy darted outside in hopes of spotting something large and furry. All she saw was the neighbor’s dog but we did end up seeing our share of wild animals. David and Edie insisted on taking us to the Alaska Wildlife Conservation Center at the southern end of Turnagain Sound. The Center serves as a wildlife sanctuary and is designed to duplicate the animals’ natural surroundings. They have done a good job. The photos in this blog were taken there. 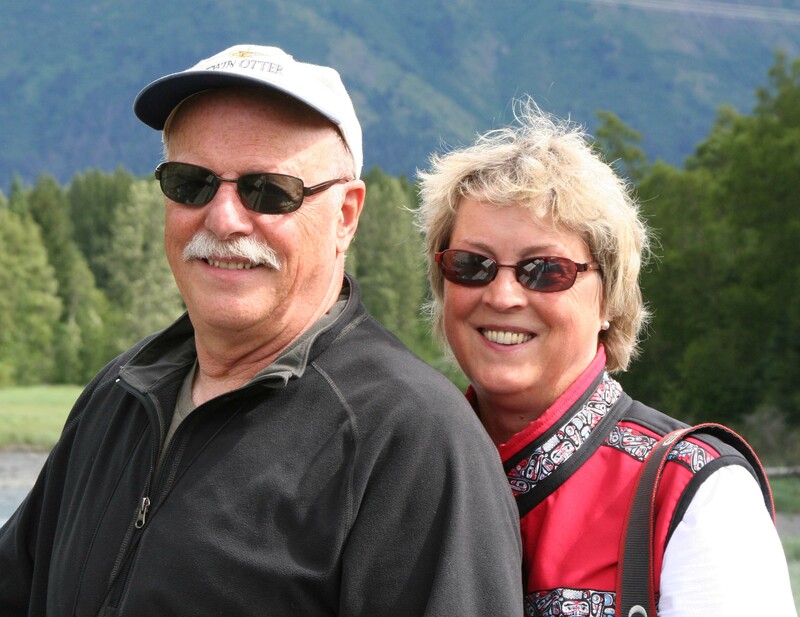 Our trip down Turnagain Arm to the sanctuary was a trip down memory lane for me. It was one of my favorite drives when I lived in Alaska. 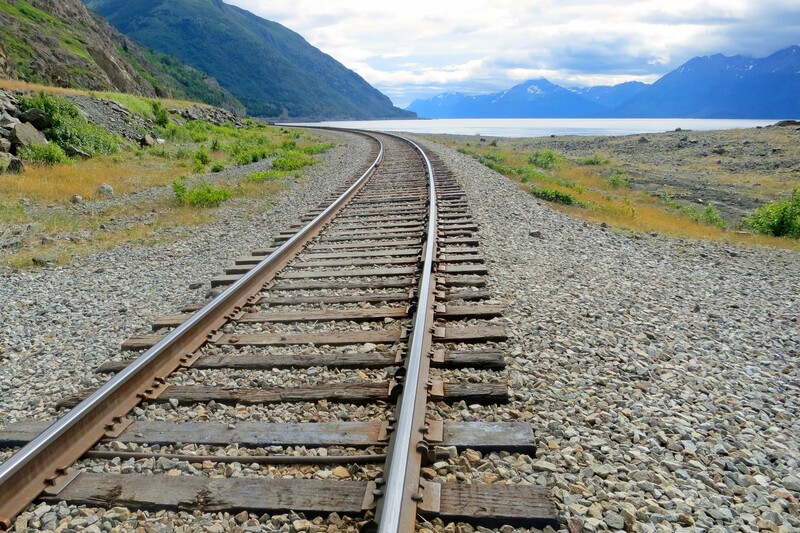 A shot of the railroad tracks running along Turnagain Sound. The V in the mountains on the right is where the town of Hope is located. 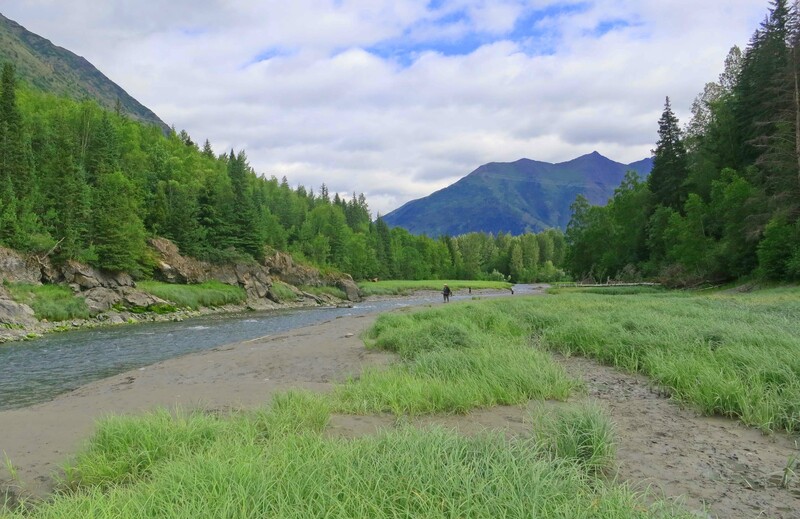 Hope was the starting point for 100 mile backpack trips I led across the Kenai Peninsula. We stopped off at Bird River on our way down Turnagain Arm. The dots on the river are people fishing for salmon. Three days later we would be fishing for salmon on Kodiak Island. 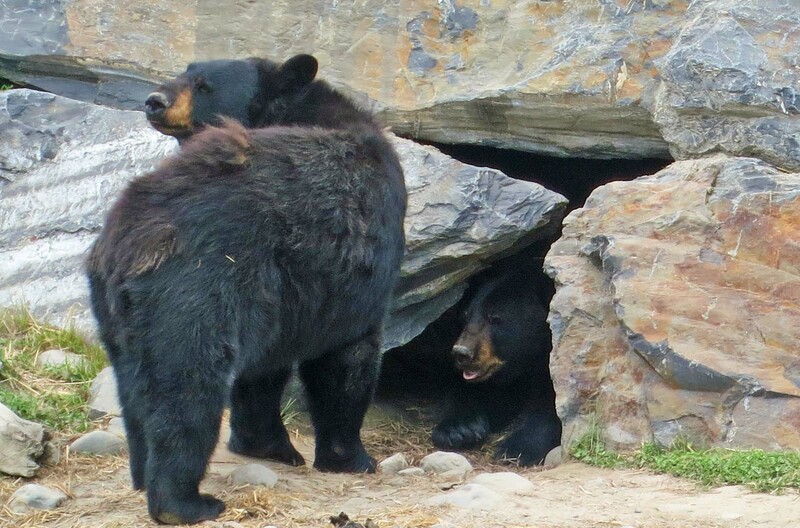 Black bears are smaller than their cousins. I once woke up with one standing on my chest in Yosemite. I screamed loudly. You may have heard me. 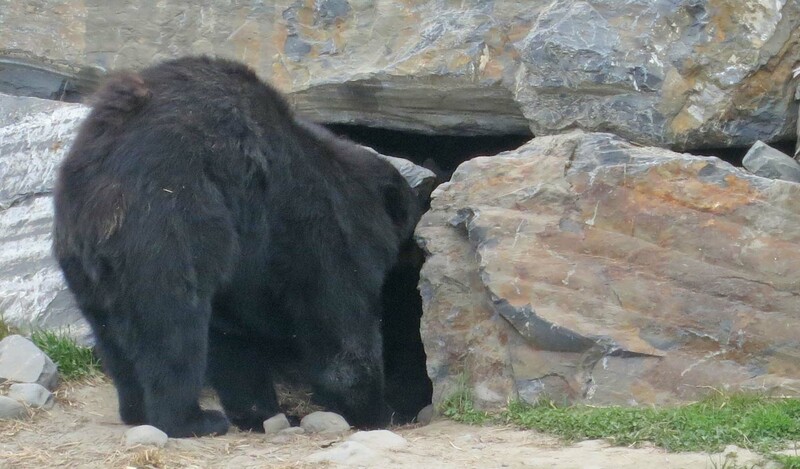 This guy was about to join his companion in the cave. 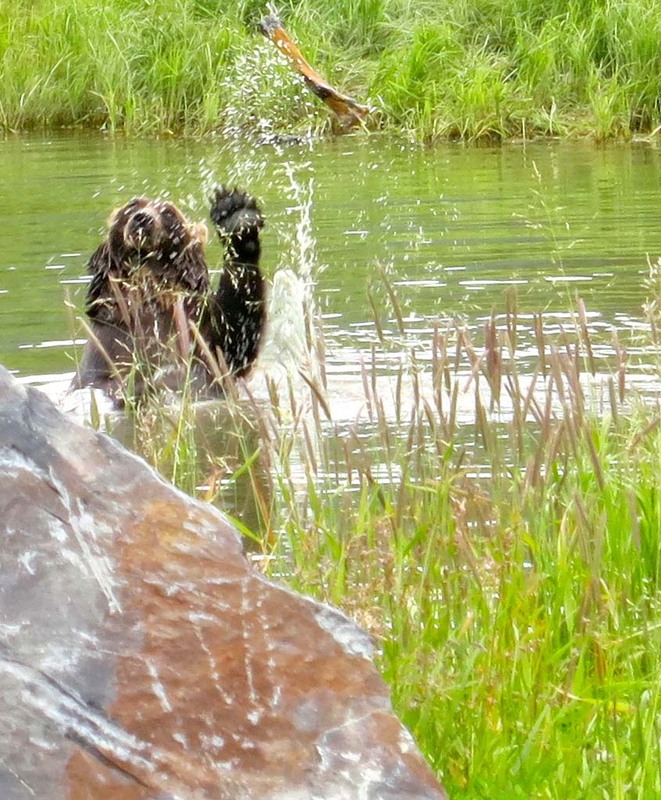 Here he catches the bone with one paw while pointing out his skill with the other. He didn’t have to persuade us. 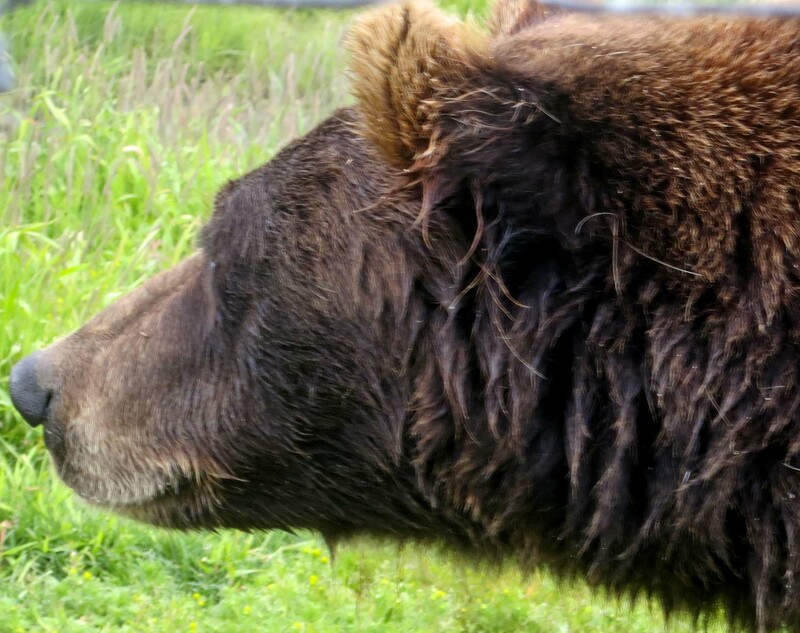 One wet Alaskan Brown Bear, up close. Check out the claws on this guy. 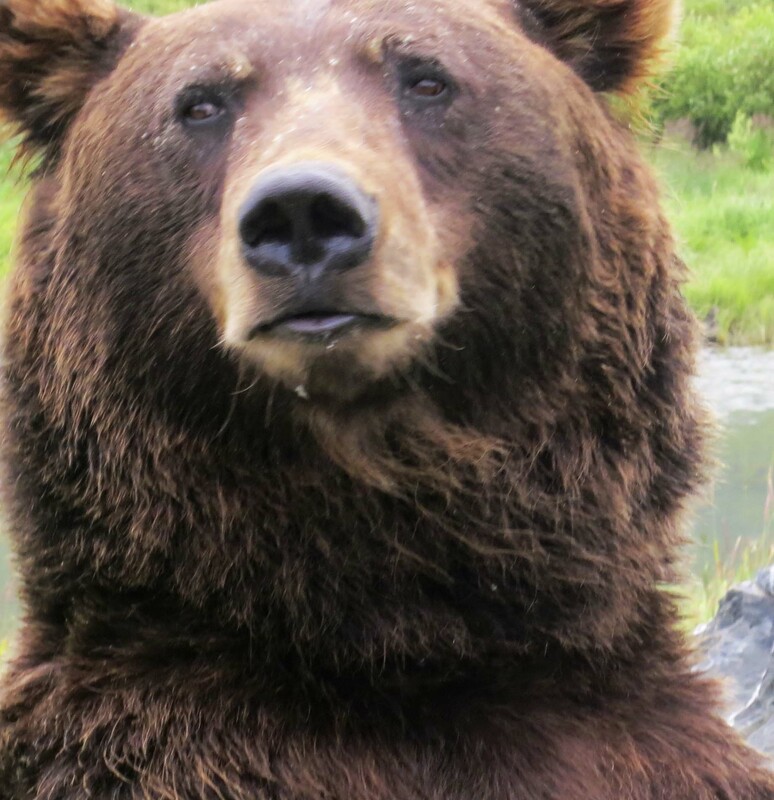 My grandson Connor insisted I include this head shot I took of one of the Brown Bears. The bear was sitting up. 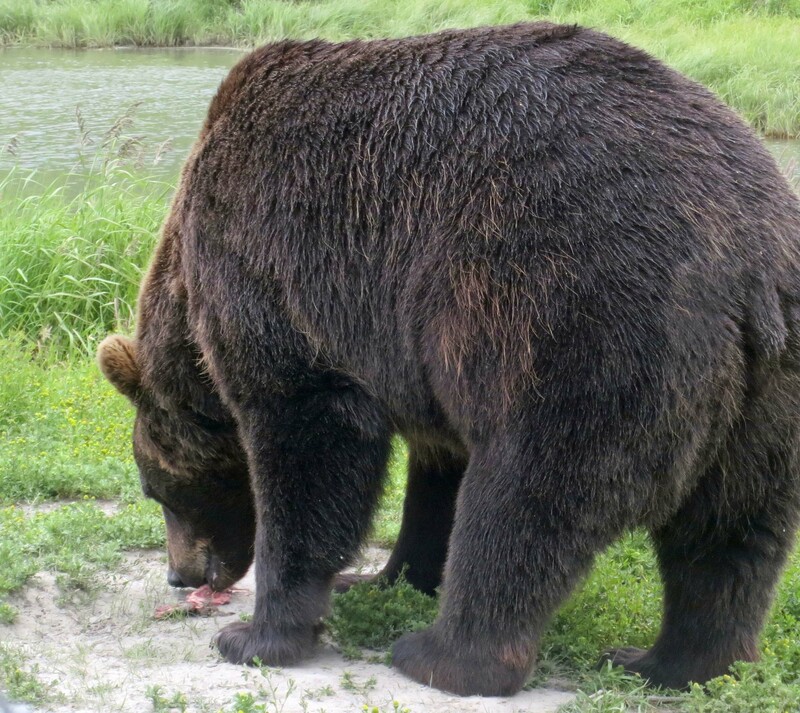 I thought I would conclude with this photo because it emphasizes just how big Alaskan Brown Bears become on their diet of salmon. A large male can weigh up to 1200 pounds. Amazing!! Such gorgeous creatures…. How lucky, WOW! Oh wow – as much as we love animals this is one we’d really rather not try to squish in a travel compartment 😉 Incredible and magnificent in the wild. What great shots you have taken. Ha ha ha – just open the side door and we’d be whooshed right through! What a fantastic trip you and Peggy are taking.. 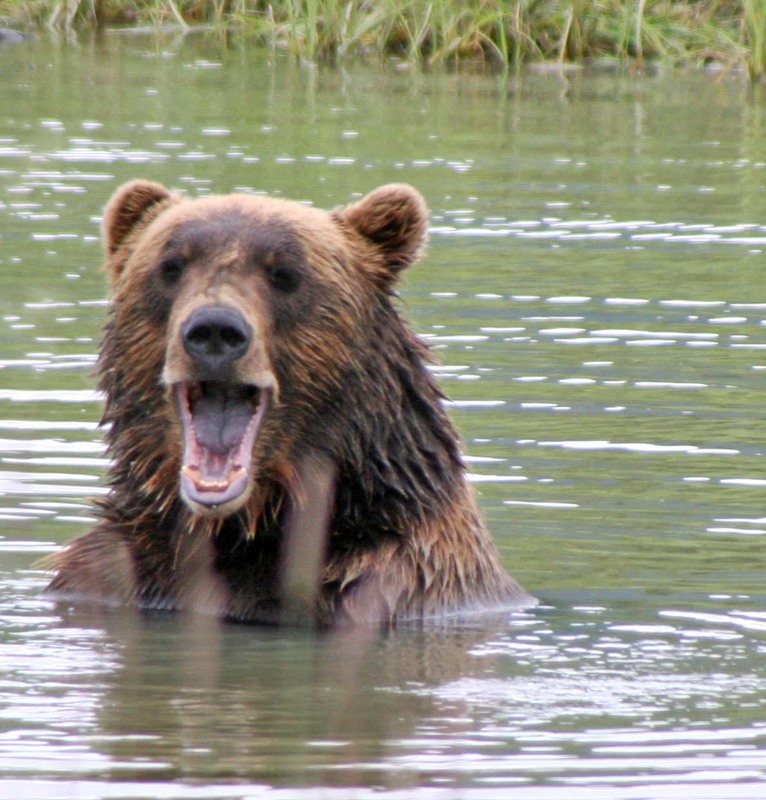 Surprise, surprise, bears do not scare me. Well, let’s say from afar.. Big, beautiful creatures they are.. 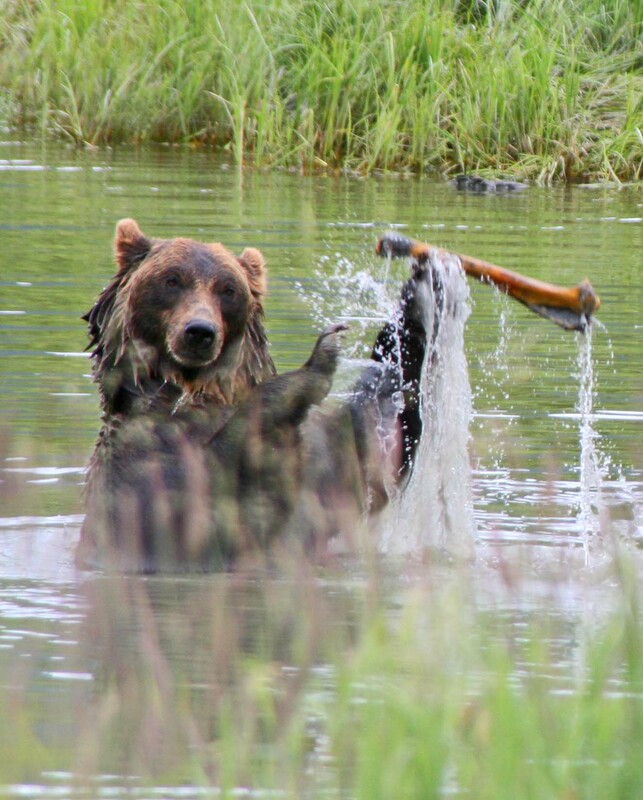 The thought of bears playing is just delightful. Cubs, of course. But a nice, big one like that? What a great set of captures. I’ve never seen a bear in the wild. Coyotes, bobcat, assorted deer and antelope, sure. Moose and elk, too. But no bears. If I ever did, I’d prefer to be with someone who has experience wtih them. I can’t imagine turning around to see one. Oh, my. After two months in Alaska, the only bear we saw was a grizzly from about a mile away, in the bottom of a valley, in Denali. We didn’t feel ripped off, but when hike after hike had people saying “watch out for the bear up the trail” but no bear sighting, we were a little disappointed. I guess next time, kodiak will be on the list. Alisonanddon suggested I head your way after reading my blog. They told me you knew more about US National Parks than anyone they knew. I guess you may have an idea about how to get my idea further out there? Wes. A worthy re-run. The bone thrower makes that certain. Did they let you drive the train? Lets hear a round of applause for the bone juggling bear, and to you Curt, for showing up to record the performance. Turnagain Arm and Chugach State Park bring back memories for me too. Some places are so compelling, they stick with you. I had no bear incidents, but these are Places, with a capital P, and they stick with me many years later. Oh yeah, combat fishing we called it, when they’d line up in the Kenai River when I lived there. It was a surprise to me, coming from Idaho, that people would bother to fish right next to 27 other people fishing.